China has landed a military aircraft on one of its manmade islands in the disputed South China Sea. It is thought to be the first time China’s military has publicly admitted to landing a plane on the artificial island, known as Fiery Cross Reef. State media said the plane evacuated three injured workers from the reef. 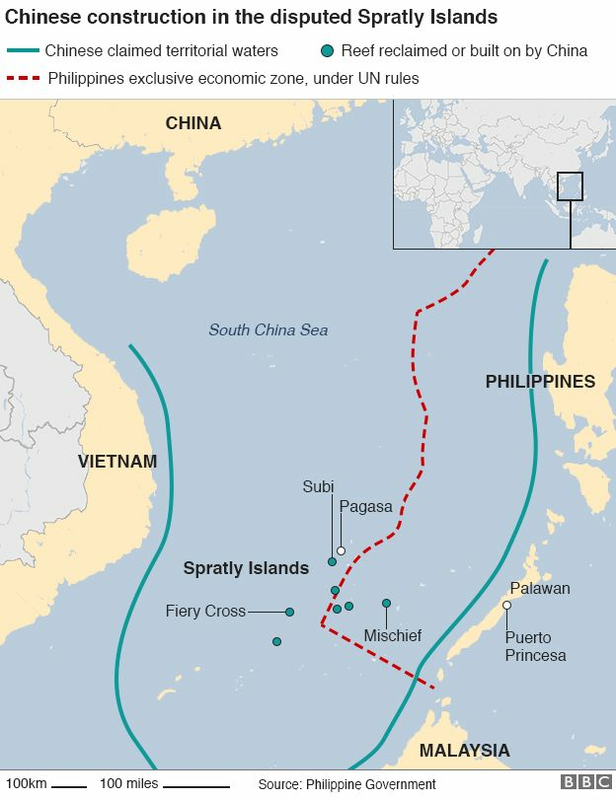 China and several of its neighbours are locked in a territorial dispute over the South China Sea, which Beijing claims almost in its entirety. The military plane landed on Sunday morning to pick up three construction workers who were hurt, and flew them to Hainan island for treatment, state media said. China has previously landed civilians planes on Fiery Cross Reef, sparking criticism from Vietnam, who also claims the territory, and the US. Beijing says it is building artificial islands and structures on reefs for civilian purposes, but other countries have expressed concern over the possibility of the facilities being used for military purposes. The US has said China’s island-building aggravates regional tensions and prevents vessels from navigating freely though the area. China, Taiwan, Vietnam, the Philippines, Malaysia and Brunei all claim areas within the South China Sea. China turned Fiery Cross Reef into an artificial island through a massive dredging operation, and constructed buildings and an air strip. In February, Taiwan and the US said China had deployed surface-to-air missileson another disputed island, called Woody or Yongxing Island, in the Paracels. China responded by saying that the US was militarising the South China Sea through its air and naval patrols. The US, which officially takes no position on the territorial disputes, describes the patrols as “freedom of navigation” operations to ensure access to key shipping and air routes.